Recently I viewed the movie Transcendence in which the consciousness of a man was uploaded. Interesting stuff. In the movie certain risks due to this techniques were emphasized. Nevertheless it intrigued me. On my e-reader a have the eBooks like “Journey to the Future” and “The future of mind” by Michio Kaku. And I this is just only the beginning of our exploration. When do we get a kickass by our bionic duplicates? When we can no longer apply for positions in our economy? Do we still have a function in the economy beyond our role as consumers over 35 years? After the 1st and 2nd World War, we have built up our economy through horsepower and bare hands. Till from the 60’s in the twentieth century the kB’s (1000 bytes = 10/3) developed into Yottabytes (10/24). According to Cisco, the Interne traffic in 2013 contained, 17,455 Petabytes (PB = 10/15) per month. In 2018 this will grow up to 62,972 PB. It is estimated that our brain has capacity in storing memories equal to 2.5 PB of binary data. Jacques de Vaucanson (French instrument builder, 1709-1782) in 1738 build a kind of robot-duck. This machine (automaton), could only perform a limited number of advanced tasks. Machines like these were not programmable. Before that, first the computer had to be invented. 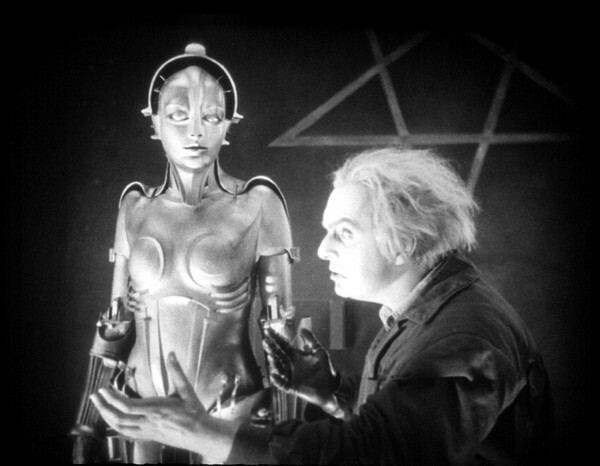 The first based human robot “Maria” we saw in the originally German science fiction film Metropolis (1927). The robot from the 50s was a square metal human figure with an antenna on top. 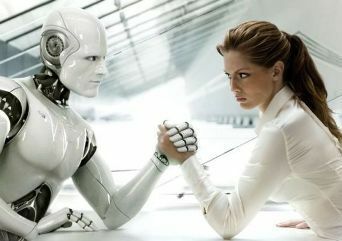 Nowadays robots are still constructed human body based. The first machines which were called robot were produced in the 50’s of the twentieth century. George Devol and Joseph Engelberger designed the first simple programmable robots for industrial use in 1954. Our eye vision quality reduces from our 40th year of age. The Chinese have invented the first eye prosthesis. A piece of wood with a very small hole in it. Try it with both thumbs and forefingers to make a very small hole together and look there on. Very sharp sight as a result. The evolution today gives us all kinds of trendy glasses on out nose. Next step is that bionic lenses will be implanted. So we develop towards the Six Million Dollar Man (1974) and beyond. At this right moment we are developing robots that surpass ourselves. Technically, locomotive and even neurological thought patterns are all matched. It apparently looks like a matter of time that people will be left behind. Technological power which exceeds our brain functions. Neurological connections occur between machines and humans. That’s an ethically fraught proposition! Intriguingly is the strategic social initiative 2045. They drop their milestones until the year 2045. An initiative from Russia. A quick and technological evolution of our “man”. 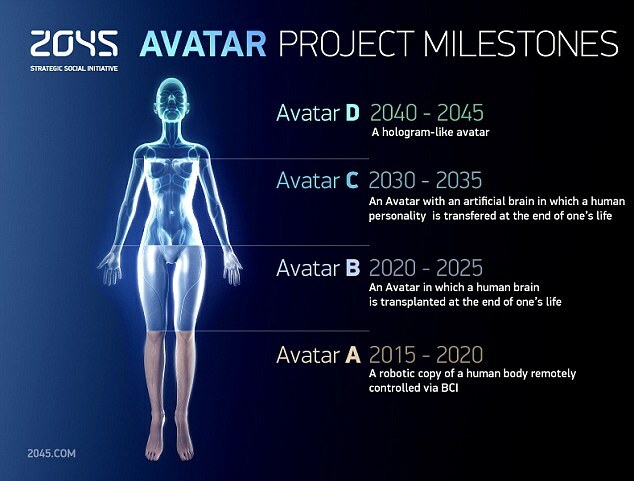 A hybrid development to a hologram like an avatar where our consciousness is implanted. Our body, towards economy rapidly grows less important. From the time of industrialization we are in charge and command machines do all the work. The white collar behind the buttons and the blue collar man still performs the manual tasks. The manual work processes in any case are automated today to much cheaper and more consistent solutions. But aren’t construction workers still needed on the site to build houses? No! Today prefabricated houses are produced in different factories. Installed walls, kitchens, etc. are mounted within 8 days to a plug & play habitable house. And this happens already in 2014. Our knowledge processes as well as manual labour is taken over by technology. Our only remaining distinction versus technology will be ou consciousness and creativity (for now anyway). If we people will be value add in economy, at least the employees profile totally differs from the knowledge based profile of today. Human Resourses departments wake up! The video below shows us our future role in the economy. Should we talk about our future role the economy at this right moment when the world is on fire? When ideological and religious wars flooding a blood red earth. When the world screams as a result of ideological violence and land grabbing. When antisocial and ego driven forces are filling the news. Should we humans focus on solving these issues first? Can we ethically replace our body and our consciousness imprisonment in machinery and avatars? We already have high unemployment. What if there is less space for our people in the economy? Will we soon control the economy through our uploaded consciousness? And how many of those consciousnesses are needed? Questions to which I do not know the answer now. Issues with which we have to deal on our agenda. The biggest question for me is whether we are able to answer these dilemmas before development has overtaken these questions. I do not know if this is an open-ended blog or an open-start blog…. Dit bericht werd geplaatst in economy, human, robots, Technologie, technology economy en getagged met avatar, civilization, consciousness, consumers, economy, human, neurological, Robot, robots, technological, uploading, wearble technolgy. Maak dit favoriet permalink.